The Ticket to Ride board game, manufactured by Days of Wonder, allows players to build railway routes through different locales using plastic train cars and a board that represents a map of the area. Ticket to Ride is a set collection game like rummy. However, instead of just laying down melds of identical cards for points, players use the cards to claim train routes to connect cities. Gameplay is for 2-5 players aged 8 and up, and takes between 20 minutes and an hour to play, depending on the decisions players make and the pace at which they do so. 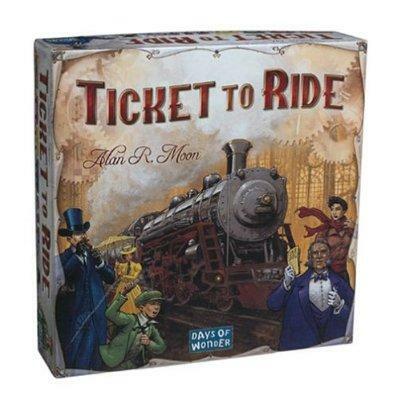 Ticket to Ride can be purchased at hobby game stores and mass-market retailers such as Toys R Us, Walmart and Target. If you'd rather shop online, try at Amazon or Fair Play Games. The first steps in setting up the game are sorting the plastic train cars by color and separating the card deck into train car cards and destination cards. Then you can get ready to play. Give one set of train car cards to each player, along with its matching score marker. Have everyone place his or her score marker on the start space in the bottom left corner of the board. Deal each player four train car cards. Put the rest face down on the table. Flip over the top five cards and lay them out so everyone can see. Deal each player three destination cards. He or she can keep all three or discard one at this time. The object of this game is to get points by making train routes. Each route has a predetermined length and color that is printed on the board. For example, the route from Los Angeles to Las Vegas on the original North America version is made up of two gray rectangles. This means a player can make this route using two gray train car cards. It's not possible to make it using cards of another color or using a different number of cards. Note that the color of the route is unrelated to the color of a player's plastic train cars. The yellow player can make a gray route, for example. Draw two train car cards, either both from the deck or one from the set of face up cards and one from the deck. Note that if a player draws a locomotive card, which can be used for any color, from the face up cards, he or she doesn't get to draw a face down card. Secure a route by playing the required cards and placing his or her train cars on the board in the designated spot. Draw three destination cards, keeping one or more of them. There is no card limit. Players can have as many cards as they like. Play passes clockwise around the table. Players get additional points for fulfilling the routes described on their destination cards. There is also a 10 point reward for building the longest string of connected routes. Players lose points if they have unfulfilled destination cards left in their hands at the end of the game. Strategy comes into play in this game since the number of routes is finite. A player cannot play his or her trains on a route that has already been claimed by another player. Each player has to decide if using a turn to collect more cards to gain more potential points is better than playing a less valuable route right away to lay claim to it. 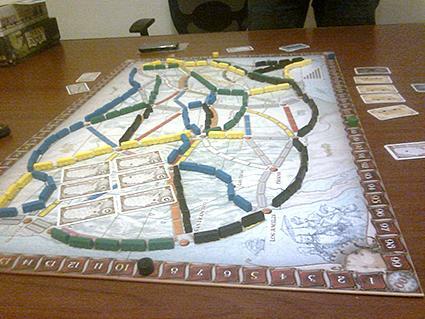 The Ticket to Ride game ends when a player gets down to two or fewer trains at the end of his or her turn. Then each player gets one more turn before tabulating scores. In the event of a tie, whoever has the most fulfilled destination cards wins. Europe in 1912 offers new destination tickets for Ticket to Ride Europe. USA in 1910 offers new destination tickets for the original Ticket to Ride. Nordic Countries is a standalone version designed for two or three players. Switzerland is another standalone game. Marklin is a standalone version featuring a German map and Marklin toy trains on its cards. Alvin and Dexter is an expansion of two wooden figures representing monsters rampaging around the map. Map Collection 1: Team Asia and Legendary Asia is a special map offering cooperative play between players. Map Collection 2: India and Switzerland is a special map offering unusual scoring options. Map Collection 3: Heart of Africa maps central and southern Africa and adds Terrain Cards. Ticket to Ride is suitable for children and adults alike. The train theme appeals to kids, and will soon have then planning out their routes while simultaneously learning about maps and how to read them. Grown-up players will enjoy the strategy angle, and you can keep the game fresh and exciting by adding some of the available expansion packs.